I have no idea how to answer people when they ask me where I’m from. I was born and raised in Texas. At 22 years old, I moved to Chicago, then Washington DC, then Birmingham, England, then Wellington, New Zealand where I bought a house, had a child and became a NZ citizen. Now I live in Melbourne. My standard response to that question these days is ‘I’m originally from the US but I lived in New Zealand for 6 years’. At least that explains why I have an American accent and can accurately spell and pronounce Wainuiomata. These are rare qualities. One of the downsides of constantly uprooting and moving to a new place is this nagging feeling that I’ll always be an outsider, distanced from the locals and the connection they have to their home. Thinking about this for too long makes me depressed, which is sooo not my thing! I’ve found, as a side effect of working at the National Library of New Zealand, I can find connection to where I am by absorbing its local history. This surprised me because I’ve never taken much interest in the local history of my own hometown – The Colony, Texas, a small Dallas suburb founded by property developers keen to make more money from the sprawling Texas landscape. While working at the National Library, I figured out that by exploring a place’s stories, I could find my own sense of place. History books bore me, but I do love images, which is why I was so glad to find so many historic photos, newspapers and ephemera digitised and made available online. Here are just three of the weird and wonderful bits of Wellington history I stumbled upon. While it’s not necessarily a trip down my memory lane, it does remind me of home. In 1928, a trainee nurse was called out to a home in Island Bay all on her own to deliver her first baby. She was filled with terror thinking of all the abnormalities of labour she had learned so much about in her studies. When she arrived at the home, the mother was well into her first stage of labour while her other six children (!!) were running amok. The husband eventually returned home and hacked the bedroom door down with an axe. Check out the full story in the January 1929 issue of Kai Tiaki: the journal of the nurses of New Zealand on PapersPast. The Evans Bay Christmas Carnival ran throughout the 1930s and featured carnival rides and sideshow acts like Anna John Budd, Chang the Chinaman with an orange-sized head (no relation to the character on Community) and Venus the lady with 500 tattoos (risque!). They also had pram races (were the babies on board? ), and get this: in 1935 they had a midnight ‘battle royal’ where, according to the organisers, they fought it out with handfuls of confetti. Sure beats the lame Santa parade they have nowadays. I couldn’t believe all that excitement took place right down the street from our old flat in Hataitai. I often look through old photos of Wellington beaches. I really love that the people who visit them come and go over time, but the beaches themselves don’t seem to change much. This is Lyall Bay in 1929. The kids are playing on something called a ‘witch’s hat’. Two things strike me about this photo. The first is how strange it looks to see people casually lying on the sand fully clothed in business attire. The second is a more personal observation: the woman in the centre of the photograph is using a paper parasol to shield her child from the sun. 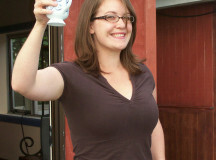 When I first came across this photo a few weeks ago I saw her and immediately thought, “Oh my god, that’s me”. 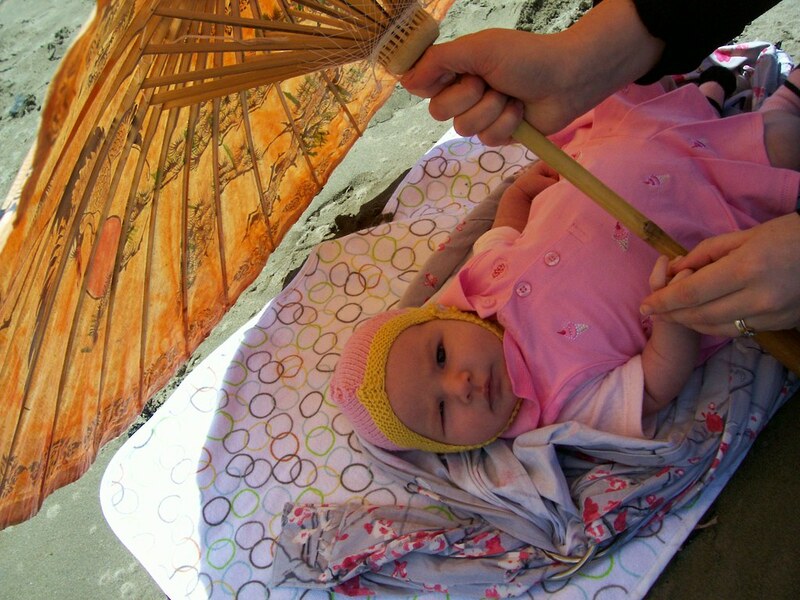 I did the exact same thing with our newborn daughter, on that beach, with that parasol. Ruby in the shade, Lyall Beach, Wellington. Image licensed under Creative Commons: CC-BY-SA.